As I described in my cookbookedition of Odds & Ends a few weeks ago, I’ve had a recent influx of new cookbooks to review and enjoy. I was particularly excited about Emeril’s Cooking with Power because even though I don’t have a pressure cooker or a deep fryer, I’m always looking for new ways to use my slow cooker. I’ve made a few different tomato soup recipes over the years because if there’s anything that screams comfort food, it’s tomato soup and grilled cheese. When I saw Emeril had a tomato soup that could be made in my crockpot, I couldn’t wait to give it a try! The book recommends serving this as a first course at a dinner party, a suggestion I don’t at all disagree with. 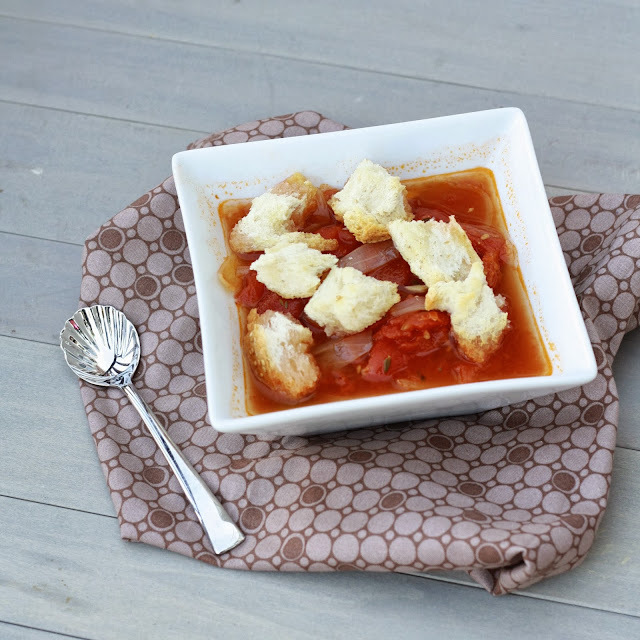 While tomato soup is often considered simple and homely, this version is made fancy with homemade croutons and a freshly made basil oil. I wasn’t serving for company and was more interested in packing it for lunch, so I skipped the basil oil (recipe included below still!) but did make the homemade croutons. The soup manages to be spicy and hearty, and I can see why it would be a good inclusion at a dinner party. Me? I was just happy to take it for lunch, even though throwing together a grilled cheese in the middle of the day wasn’t possible! 1. To start the soup, heat olive oil in a large skillet over medium-high heat. Once hot, add the onions, 1 tsp salt, and crushed red pepper. Cook, stirring occasionally, until onions are softened (3 minutes). Add the sliced garlic and cook for an additional 3 minutes. 2. Transfer onions and garlic to the slow cooker and add the tomatoes, chicken broth, thyme, basil, 1 tbsp salt, and the Parmesan rind. 3. Cook on high for 6 hours, stirring occasionally. 4. To make the croutons, preheat oven to 400F. Place the torn bread on a baking sheet and drizzle with olive oil, tossing to coat bread. Season with salt and pepper and bake for 12-15 minutes, until golden and crisp. Set aside to cool. 5. To make the basil oil, combine the olive oil, basil, and minced garlic in a food processor or blender. Process or blend until leaves are finely chopped. Transfer to a small bowl and season with salt to taste. 6. When serving soup, remove and discard the Parmesan rind and thyme sprigs. Basil sprigs can be included or discarded, based on preference. Season with salt and pepper, if needed. Ladle soup into bowls and garnish with the croutons. Drizzle the basil oil over the soup to taste and sprinkle with pepper.